District 4 City Council Special Election has nine, count ‘em, nine candidates running for the City Council seat vacated by Tony Young at the end of 2012. A candidate must get more than 50% of the vote to win, and by all accounts that isn’t going to happen on March 26th ‘meaningless’ election could change the face of San Diego politics and community development for years to come. Part One in this series on District 4 (here) presented (an all-too-small) slice of the history of the area with a general overview of the present-day political situation. We also broke the story about the GOP-type dirty tricks campaign going on in D4. 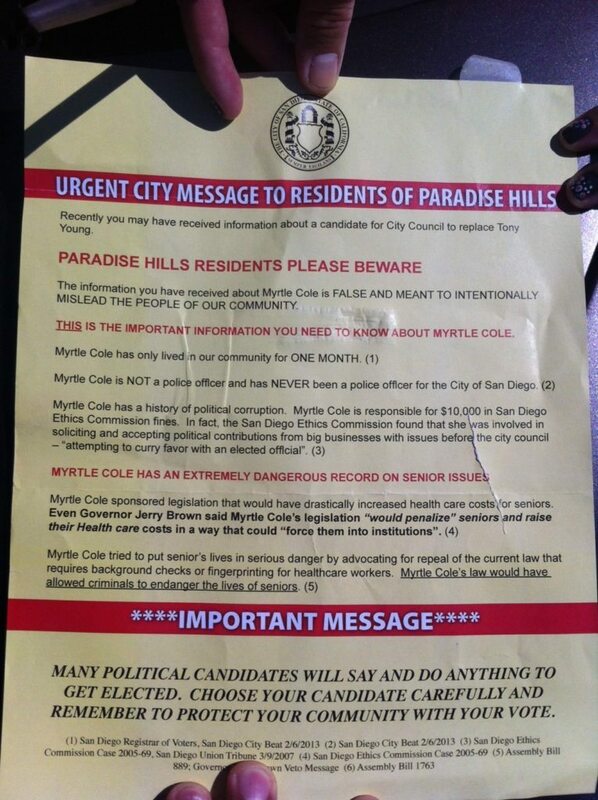 Here’s a copy of the faux “City” mailing that’s going out attacking Myrtle Cole. There are nine, count ‘em, nine candidates running for the City Council seat vacated by Tony Young at the end of 2012. A candidate must get more than 50% of the vote to win, and by all accounts that isn’t going to happen on March 26th. So there’ll be a run-off. The trick here will be picking the top two candidates. What follows are thumbnail sketches in alphabetical order. Most of this is simply lifted from candidates’ web sites, whatever turned up on Google searches and whatever gossip we’re heard recently. Nine candidates! I’ll be lucky to spell everybody’s name right. However, SD Free Press reporter Andy Cohen is promising that he will conduct interviews with the run-off candidates. One of the oddities of San Diego politics is that political boundaries have little to do with school district boundaries. That’s why I snicker whenever some downtown politico claims he/she’s gonna ‘fix’ our schools. Which ones? Poway? San Diego Unified? Lemon Grove? Which is how we come to Blanca Lopez-Brown, who’s both lived in the 4th District for over three decades and is President of the Board of Trustees for the Lemon Grove School District. With a small business background, four kids and an armful of degrees, she’s not lacking in intelligence or good intentions. She’s an advocate in the areas of bi-lingual literacy and community wellness, able to drop the magical ‘Michelle Obama” name brand fairy-dust as a result of her acclaimed work in building healthy communities. She’s the only one of this whole bunch who has actually ever won an election. (Twice. Uncontested.) And she’s a Latina. Unfortunately, Ms. Lopez-Brown lacks a ground game and any significant financial backing. Her nominating petition contained the second-lowest (159) number of signatures of any of the candidates. Some long time San Diego activists might better recognize her as Myrtle Akili (she’s Cole by re-marriage) who somehow survived working as a community rep for the City Councilman John Hartley back in the days when he was busy selling out residents working to mitigate the impact of bulldozing over a thousand residences and businesses for what we now know as Interstate 15. Although she’s lived in Rolando for two decades, Cole attended the University of Arizona and worked as a police officer in Tucson after graduation. When she first landed in San Diego, Cole worked as a law enforcement officer with the San Diego Community College District, moving on to work for the City Council implementing ‘Community Oriented Policing’. These days Myrtle Cole works for the United Domestic Workers (UDW), a union that actually works very hard for people who provide in-home services to low-income seniors, children and people living with disabilities. Along the way she worked political campaigns with Charles Lewis, Tony Young, Kristine Kehoe, Francine Busby, Shirley Weber, Toni Atkins and Bob Filner. So it comes as no particular surprise that Myrtle Cole is the endorsed candidate of the San Diego Democratic Party. And the Central Labor Council. In a district with the highest percentage of registered Democrats in the region, these supporters count for a lot. The GOP types downtown aren’t taking this sitting down. Voters in D4 have been getting faux “City” mailers saying that she’s a carpetbagger, never worked in San Diego as cop, has a ‘history of corruption’ and that she ‘sponsored’ legislation that would have ‘drastically increased health care costs for seniors”. Given that she’s never been elected to office before it’s hard to see how she could have ‘sponsored’ any kind of legislation. And the rest of this GOP sponsored inspired (okay, it’s just one of their scummy front groups) hit piece is composed of ‘facts’ that are juxtaposed or to be politically correct about it, they’re “factually challenged”. What Cole needs is better is name recognition. Supporters are hoping that an aggressive ground game covering all D4 communities, complete with intensive phone banking will turn the tide. It seems like Dwayne Crenshaw has always been running for something. He was student body president at San Diego State University. He’s made runs at getting elected to the State Assembly and the Community College Board. And this will be his third attempt at capturing the city council seat for District 4. Director of Government Relations and Community Ownership for the Jacobs Center for Neighborhood Innovation and most recently as Executive Director of San Diego Pride. And, needless-to-say, he’s got friends in high places, having served as an Unruh Assembly Fellow, along with stints as an aide to a City Council member, a county supervisor and two state legislators. His two previous campaigns for the D4 seat have given him some solid name identification. During his 2004 campaign for the seat, following the death of Charles Lewis, he was outed as a gay man in a letter to the editor published by the Union-Tribune. A lot has changed in the last nine years, and that outing, which some saw as a negative thing back then, could very well prove to be an asset this time around. Crenshaw led the pack of this year’s candidates with 530 nominating signatures and had a rather impressive lead in fundraising according to information filed back in February. He has been endorsed by the Gay and Lesbian Victory Fund. “I am very much a social-justice guy. In that vein, [liberal council members] David Alvarez, Marti Emerald—that’s me to a T,” he says. “But, at the same time, I’m very much about development, because this community needs it. She’s a lawyer, and owns a firm specializing in fighting foreclosures. Studied PoliSci at Spelman College, one of America’s oldest historically black colleges for women located in Atlanta, Georgia. Montgomery’s campaign motto is “Integrity. Innovation. Inspire.” And beyond platitudes about a ‘core set of values’, ‘an innovative vision for the 4th district’ and ‘realizing the dream of continued revitalization of this district’, there isn’t really much of a track record to look at. “Almost dying in my 20s really puts things in perspective for me,” she said. An autoimmune disease that attacked her skin and muscles laid her up for more than five years, but with family help, she was able to recover enough to earn a law degree from Cal Western and pass the bar by age 30. Montgomery apparently hasn’t raised enough money to file campaign disclosure information. Outside of a rather stale website & Facebook page, there does not appear to be much of a campaign going on here. Neighborhood activist Barry Pollard returned to his childhood digs in Valencia Park after attending the University of Louisiana in Lafayette and starting a family. Things weren’t quite what they used to be: crime, drugs and deteriorating streets. The Neighborhood Watch group he started is still active today. In 2010 Pollard ran against Tony Young and got trounced. His connections with the community, however, run deep: there’s his involvement with the Encanto Planning Committee, Past President Martin Luther King Democratic Club, the NAACP, Black Political Action Committee of San Diego (BAPAC), the Coalition of Neighborhood Councils, The ARC of San Diego and Common Ground Theatre. But none of that carries as much weight as his lobbying work with the Redistricting Commission to increase black voting power in District 4. The addition of a ninth council district by way of the strong mayor reforms meant subtracting some neighborhoods from what was then Tony Young’s turf. Pollard delivered the goods as the heavily Latino constituencies in Mount Hope and Mountain View ended up in the new voting area. Eligible Latino voters will still slightly outnumber eligible black voters in the new 4th District. But even though signs of the district’s shrinking black and growing Latino populations are evident in businesses and churches across the district, there is still little political mobilization among Latinos. Thus, the powers that be in District 4 owe Barry Pollard big time, even as their influence is waning. And they’ve delivered with money, endorsements from the traditional pillars of the community and volunteer energy. There has been, however, one little bump in the road. It turns out that the ‘business’ side of Pollard’s resume is a little shaky. VOSD’s Liam Dillon posted a story about how the candidate was operating his human resources business without a city license. It was cancelled last year due to unpaid fees. And he owes the state more than seven grand in unpaid taxes and fees. Like I said, a bump in the road. Pollards says everything’s goning to be copacetic real soon. There was a full house at the Mount Erie Baptist Church on November 28th. Mayor Jerry Sanders and County Supervisor Ron Robert were there to present resolutions. Congressional and State legislators sent representatives who spoke about more than three decades of extraordinary service. Choirs sang. Preachers testified. The day was all about honoring Pastor Ray L. Smith, longtime Senior Pastor at United Missionary Baptist Church. And future City Council candidate. In some small way this was all a miracle. Forty years ago a very scared young man named Ray L. Smith was sent to Chino State prison for his part as getaway driver in the hold up of a Bob’s Big Boy Restaurant. He did three years time and emerged a changed man. Smith went on to become a central player in gang-diversion programs in the community. ‘High Hopes’ was a Smith-run re-entry program for the formerly incarcerated; assisting them in their transition back into the community as viable citizens. ‘Pastors on Point’ is a social service/community advocacy program that has campaigned for more food stores in the area. And they have been known to question the growing influence of the Jacobs Center, whose developmental efforts have included casting a wide net and encouraging community participation by Latinos and Asians. The Ray L. Smith web site includes thirty four clergy members who’ve announced their support for his campaign. Once upon a time their blessings would have been a sure sign of a front runner. But times have changed. And it’s very telling that the one elected official who didn’t attend or send a representative to Pastor Smith’s celebration on November 28th was Councilman Tony Young. Now lets talk about the token Republican in the group, Sandy Spackman. She’s the only candidate not boasting about her origins in the district, although Spackman has lived there for most of her life. Her family fled communist Laos in 1976 and eventually settled in San Diego. After raising four kids she went back to school, taught for four years and ended up at the SPAWAR Systems Center. She’s president of the Lao American Coalition and involved with the Southeastern Diamond Business District. Taking a cue from Texas Gov. Rick Perry, she talked with City Beat about touring North Park to get ideas for businesses to relocate to District 4 neighborhoods. “Instead of talking about it, let’s do something about it and this is something we can do,” she told 10News. The “pothole patrol,” as they called themselves, would wait for traffic to go by, run out and work until the traffic came by again. A city of San Diego spokesman told 10News what the group was doing was actually illegal. “No, they said it was discouraged, highly discouraged. They didn’t say illegal,” Spackman told 10News reporter Joe Little. “They told 10News it was illegal,” countered Little. “They did? Well, I didn’t know that,” Spackman said with a smirk. Although he starts out boasting about his long-time residency, Villafranca actually gained his political experience by running unsuccessfully for city council in National City. Four times. Villafranca is the one candidate in this contest who is Filipino in a district where immigrants from that country settled in because it was close to the 32nd Street Naval Station, where many of them worked. He’s the Energizer Bunny of volunteerism, a compulsive helper, who can whip out a list of a dozen non-profits that he’s belonged to or worked with in past years. His experience as a real estate agent has given him the advantage of much actual experience on the streets of the communities that make up D4. Another incident was when Villafranca was asked several questions and for some reason he had several revelations going on with his true self. He mentioned “Moses” and changes. Villafranca’s explained his analogy of examples of his conversion of supporting issues in the LGBT communities and understanding the Catholic Faith. However, he evaded some questions and was not direct on his answers. It was noted that Villafranca emphasized that he wanted to let the members know that he called himself a “straight man” and that District 4 was not a Black district. The article concluded by saying that Dems for Equality ended up not endorsing a candidate, having split their votes between Myrtle Cole and Dwayne Crenshaw. Villafranca got zero votes. He’s the man who swore off Republicanism after watching numerous attempts at voter suppression seemingly aimed at African-Americans in the most recent national elections. At least that’s what he told City Beat. On the other hand, he posted a guest column on San Diego Rostra, a blog that’s home to the GOP/conserv set (but not officially affiliated), soliciting votes. And he’s been known to slip up and say “we” when talking about the GOP. In the past Williams, regardless of party, might have been considered a shoo-in for the Councilman’s job. Having started out working for County Supervisor Leon Williams, and ending up most recently employed by retiring Councilman Tony Young, his political pedigree runs deep and wide. Along the way he worked with every stripe of politician from Duke Cunningham to Mayor Susan Golding. He’s run for the District 4 City Council seat twice, losing to his future boss (Young) in 2004 and 2006. People know who he is. His name recognition is good enough that he placed a respectable second in early polling. Whether or not name recognition and his long-standing connections will get him into the run-off for this council seat remains to be seen. POSTSCRIPT: If wading through these snippets on each of these candidates was a little overwhelming for you and you made it this far, congratulations. If you weren’t overwhelmed and still want more, please see the coverage at San Diego City Beat, KPBS and Voice of San Diego, linked to throughout this story. Next Up: We’ll do our best to prognosticate what’s possible on election day. There’s so many of them running. How do you make an intelligent decision? Are you going to be recommending two? All in good time… Part 3 won’t be up for a couple of days yet. There may be some more “breaking news”…I’m waiting for things to settle out.